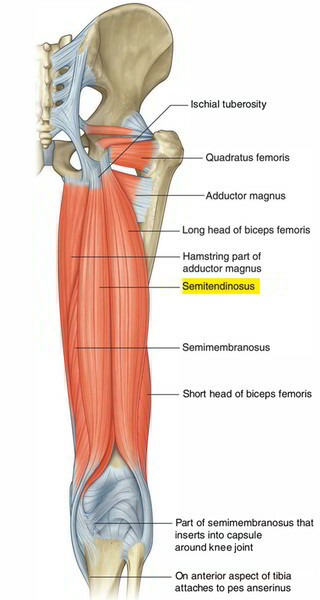 The semitendinosus muscle is located in the posterior portion of the thigh and also it is medial towards the biceps femoris muscle. Just posterior towards the tendons of the gracilis and sartorius muscles acting as a part of the pes anserinus, the tendon loops above the medial condyle of the tibia and also enters the medial side of the tibia. The semitendinosus muscle expands the thigh over at the hip joint and also flexes the leg on the knee joint. It even medially turns the thigh on the hip joint as well as medially revolves the leg on the knee joint while collaborating with the semimembranosus. The Semitendinosus muscle emerges via the inferomedial portion of the upper region of the ischial protuberance along with the long head of the biceps femoris muscle. The spindle-shaped muscle belly creates a long cord-like tendon, which is located at the semimembranosus muscle as well as goes down towards the knee as well as terminates in the lower half of the thigh. In the lower portion of the back of the thigh, the semitendinosus muscle deviates medially and also move behind the medial condyle of the femur and afterward turns downward and anterior to get attached within the upper part of the medial sides of the tibia at the back of the attachment of sartorius as well as gracilis muscles. The semitendinosus muscle, while working from below, helps in expanding the hip joint while the trunk is arched forward. While working from above, it helps in flexion of the knee joint; in case the knee is semiflexed it creates medial spin of the knee. If the foot is set, semitendinosus functions as a lateral rotator of the femur as well as pelvis upon the tibia. The semitendinosus muscle is innervated from the tibial section of the sciatic nerve.